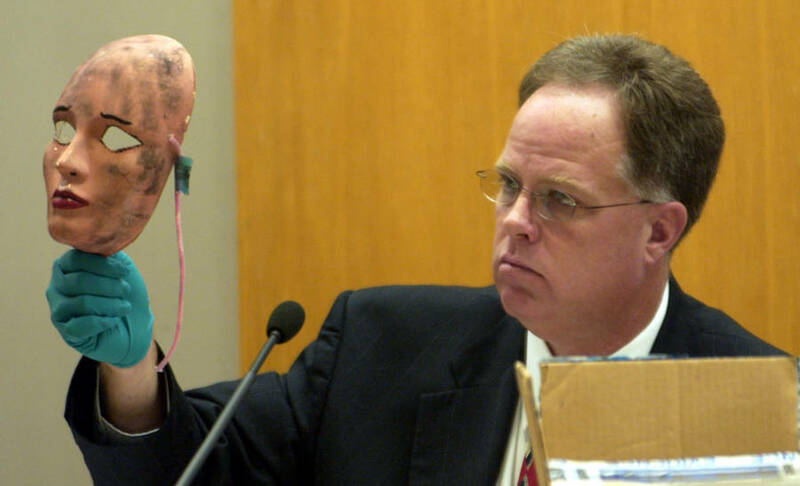 Dennis Rader: The BTK Killer Who Would "Bind," "Torture," And "Kill"
For 30 years, the Boy Scout troop leader and church council president committed unspeakable horrors against his neighbors, all the while completely unsuspicious to even his own wife. 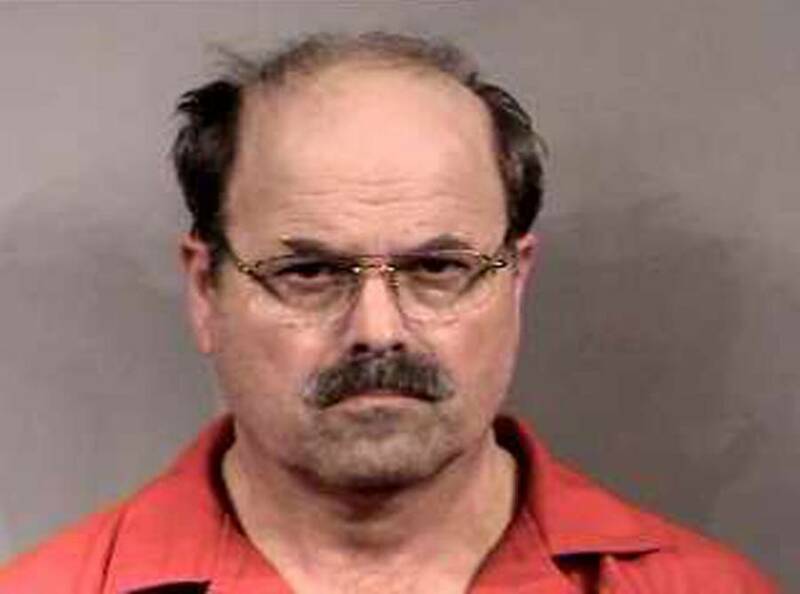 Tori’s Stories/YouTubeDennis Rader, the BTK killer, Sedgwick County, Kan. Feb. 27, 2005. Dennis Rader was the president of his church congregation, he was a loving husband, a doting father, and altogether seemed to be a reliable and responsible man. 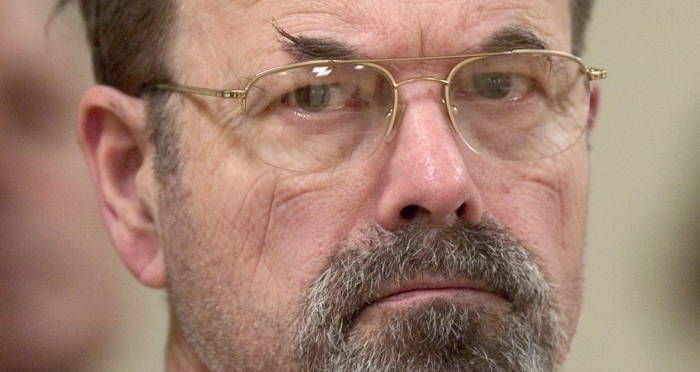 Not even Dennis Rader’s wife had any idea that he could be the BTK Killer: a man who’d tortured and murdered 10 people. She had no idea that for 30 years her father preyed on girls just like her. Rader was born on March 9, 1945, as the oldest of four in Pittsburgh, Kan. He would grow up in a fairly humble home in Wichita, the same city which he would later terrorize. Rader went on to describe how he would bind his hands and ankles with rope. He would also cover his head with a bag — actions he would later employ on his victims. He cut out photos of women from magazines whom he found arousing and drew ropes and gags on them. He imagined how he could restrain and control them. But Rader continued to maintain an ordinary outward appearance, and he attended college for a time before he dropped out and joined the U.S. Air Force. When he returned home from duty, he took up work as an electrician in Wichita. He then met his wife Paula Dietz through church. She was a bookkeeper for Snacks convenience store and he proposed after just a few dates. They wed in 1971. Rader was laid off from his job as an electrician in 1973 and shortly afterward killed his first victims on Jan. 15, 1974. While his wife Paula was sleeping, Dennis Rader broke into the home of the Otero family and murdered every person inside of the house. The children – 11-year-old Josie and 9-year-old Joseph – were forced to watch while he strangled their parents to death. Josie cried out, “Mommy, I love you!” while she watched Rader strangle her mother to death. Then the little girl was dragged down into the basement where Rader pulled off her underwear and hung her from a sewer pipe. He watched the girl choke to death, masturbating while she died. He took pictures of the dead bodies and gathered up some of the little girl’s underwear as a memento of his first massacre. Then Dennis Rader went home to his wife. He had to get ready for church, as he was, after all, church council president. 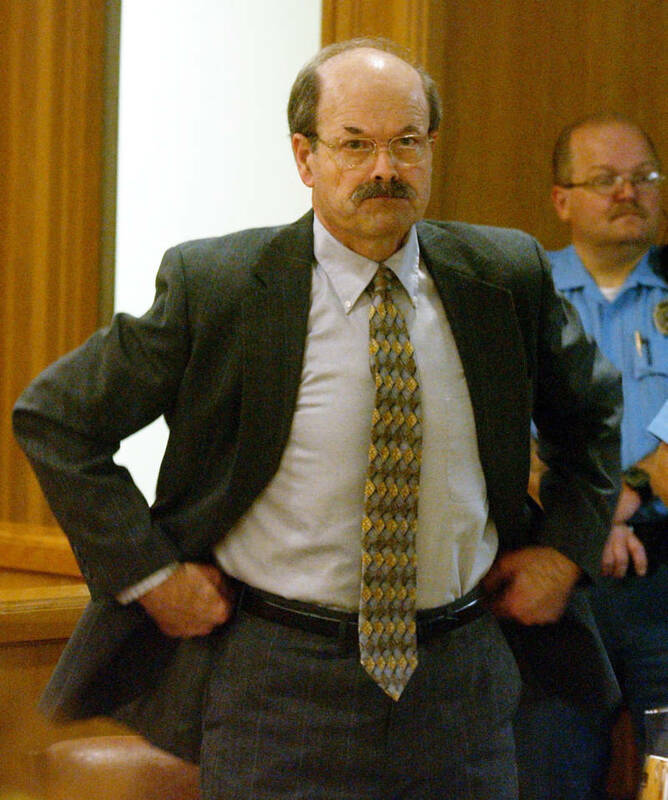 Bo Rader-Pool/Getty ImagesDennis Rader, the BTK Killer, in court in Wichita, Kan. Aug. 17, 2005. While her husband massacred a family, Dennis Rader’s wife Paula prepared to start one of her own. Paula was three months pregnant with Rader’s first child when, unknown to her, her husband began to advertise his crimes covertly. After describing how he killed the Oteros in a letter he stashed inside an engineering book at the Wichita Public Library, Rader called a local paper, the Wichita Eagle and let them know where they could find his confession. He added that he intended to kill again and named himself BTK which was an acronym for his preferred method: Bind, Torture, and Kill. But Paula did not ask questions, even when the clues added up. Nor did she ask him about the mysterious sealed box he kept in their home. She never even once tried to look inside. If she had, she would have found a treasure chest of horrors, which Rader referred to as the “mother lode.” It contained mementos from her husband’s crime scenes: dead women’s underwear, driver’s licenses, also pictures of him dressed up in his victims’ underwear, choking himself and burying himself alive, re-enacting the ways he’d killed them. Kristy Ramirez/YoutubeDennis Rader, the BTK Killer, with his children at Christmas. Not even Dennis Rader’s own children suspected him. Their father was, at his worst, a strictly moral Christian. His daughter, Kerri Rawson, would recall how once her father did angrily grab her brother by the neck, and she and her mother had to pull him off to save the boy’s life. “I can still picture it clearly and I can see the intense anger in my dad’s face and eyes,” Kerri reported. But this instance appeared isolated. When she learned of the BTK killer, it was her own father, ironically, who soothed her late-night worries. In truth, Rader had murdered the woman the night before, after sneaking out of the campsite he was chaperoning on his son’s cub scout retreat. He returned by morning to the group of young boys with no suspicions. In 1986, he killed his ninth victim, 28-year-old Vicki Wegerle while her two-year-old watched from a playpen. Her murder would remain unsolved until the BTK killer unknowingly brought himself to justice. 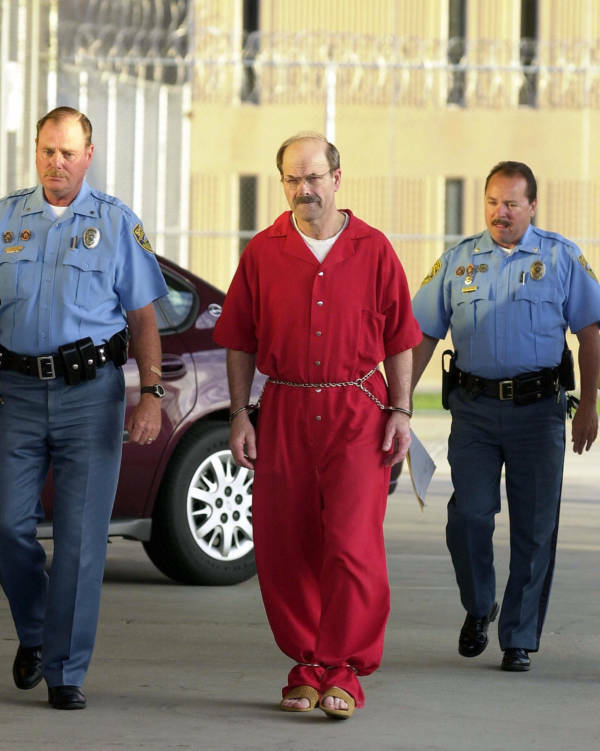 Larry W. Smith/AFP/Getty ImagesDennis Rader is escorted into the El Dorado Correctional Facility in Kansas on Aug. 19, 2005. Rader in some respect fell into domestic life and in 1991 began working for the Wichita suburb of Park City as a compliance supervisor. He was known to be an exacting officer and often unforgiving with clients. That same year he committed his 10th and final crime. Rader used a cinderblock to break through the sliding glass door of a 62-year-old grandmother, Dolores Davis, who lived just a few miles from his own family. He dumped her body by a bridge. In his last year as a free man, Dennis Rader came across a story in the local paper which marking the 30th anniversary of the Otero murders. He wanted to make the BTK killer known again and in 2004, sent nearly a dozen taunting letters and packages to the media and the police. Some were full of mementos from his massacres, some of dolls bound up and gagged like his victims, and one even contained a pitch for an autobiographical novel he wanted to write called The BTK Story. The one that got him, though, was a letter on a floppy disk. Inside, the police found the metadata of a deleted Microsoft Word Document. It was a document for the Christ Lutheran Church, authored by the church council president: Dennis Rader. DNA samples were taken from one of his victim’s fingernails and police accessed his daughter’s pap smears to confirm a match. 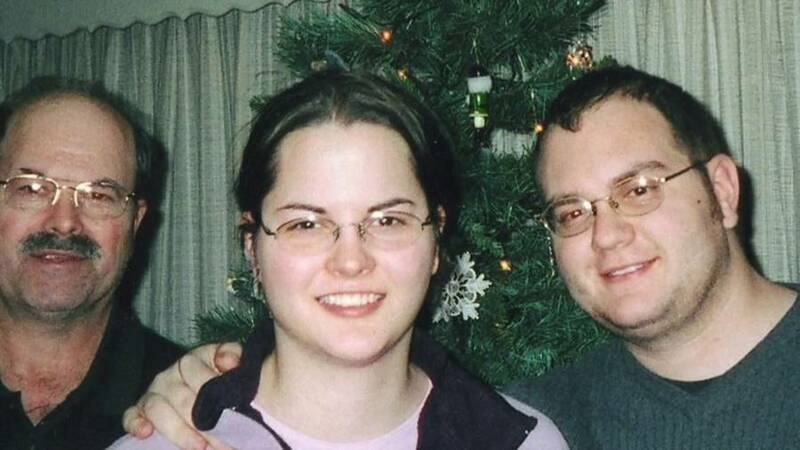 When they received a positive match, Rader was taken from his home in front of his family on Feb. 25, 2005. The father tried to keep up a reassuring face. He gave his daughter one last hug, promising her it’d all be cleared up soon. He confessed to all 10 murders, seeming to take a twisted joy in describing all the brutal details of how the women had died in court. The BTK killer was sentenced to 175 years in jail without the possibility of parole. He escaped the death penalty only because Kansas did not have the death penalty instated during the 17 years of his rampage. He was 60-years-old when he was sentenced to 10 consecutive life sentences. The BTK’s daughter speaks to his victims. Dennis Rader’s wife left her meal half-eaten on the dinner table when her husband was arrested. She would never come back to finish it. When the horrible truth of what Dennis Rader had done came out, she refused to ever step foot at that home again. She divorced Rader when he confessed to the crimes. But the hardest part of all was that, for all he’d done, Dennis Rader was still their father. After this look at Dennis Rader, the BTK killer, check out another covert killer with a double-life, Ted Bundy. Then, read up on serial killer Edmund Kemper, who as a child stalked his teacher with a bayonet.